Description: A view of Port reading yard. Description: Lite engines from Oak Island for Port reading yard with an ex-Erie Lackawanna SD45-2 on the point that was downrated to an SD40-2. Description: Four former Conrail EMD's for Port Reading yard. Description: Some tresspasser got their ATV's stuck on the tracks in Port Reading yard. Description: The Conrail Shared Assets SA22 pulls its cars across Bordentown Turnpike and up the former Raritain River Railroad Gillespie Branch. Description: A former Erie Lackawanna SD45-2 downrated to SD40-2 pulling the SA22 towards AmeriSteel. Description: CSX 8886, externally a SD45-2, repowered to an SD40-2, leads CA-11 out of DEEP. Description: CSX 7620 leads CA-11/PA-10 at speed just south of the RICK marker. 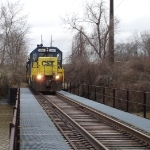 Description: CSX 7620 slows as it approaches the DEEP marker. Description: A CSX coal had outlawed and blocked much of the mainline at DEEP. CA-11 was then used to push the coal back into the Conectiv plant. Description: CA-11 power is acting as a V877 coal train as they push back into the Conectiv plant after crossing the Deepwater Canal. Description: CSX 8886, a SD45-2 repowered to a SD40-2 eases coal back into the Conectiv plant. Description: One last bend before the power from CA-11 disappears into the Conectiv plant. After this the power will return to it's normal duties on CA-11. Description: A Port Reading yard crew has jumped onto the PR52 and has begun to switch it out. Description: 8974 in Dark Future paints leads south into DEEP with a repowered SD45-2, 8886, which is now designated as an SD40-2. Description: CSX 8974 and 8886 leads CA-11 out of the woods towards DEEP. Description: Browns Yard local SA91 brings in the outlawed SA42. CSX SD40-2 8886 is a derated former EL SD45-2. Description: Browns Yard local SA91 brings in the outlawed SA42 with a pair of former EL SD45-2s for power as the day's light diminishes. Description: NS inherited at least one of the former EL SD45-2s. Description: CSX classifies their former Conrail/EL SD45-2s as SD40-2s which they essentially are since being down graded.